A building in Newton Road - probably this one - is listed in Places recorded by the Registrar General under the provisions of the Places of Worship Registration Act 1855 (2010) with a congregation of the "Reorganised Church of Jesus Christ of Latter Day Saints". The name in the list is "Community of Christ (Gloucester)", but the sign above the doorway says "The Firehouse - Golden Valley Church - Gloucester", so this is probably a "rebadging". 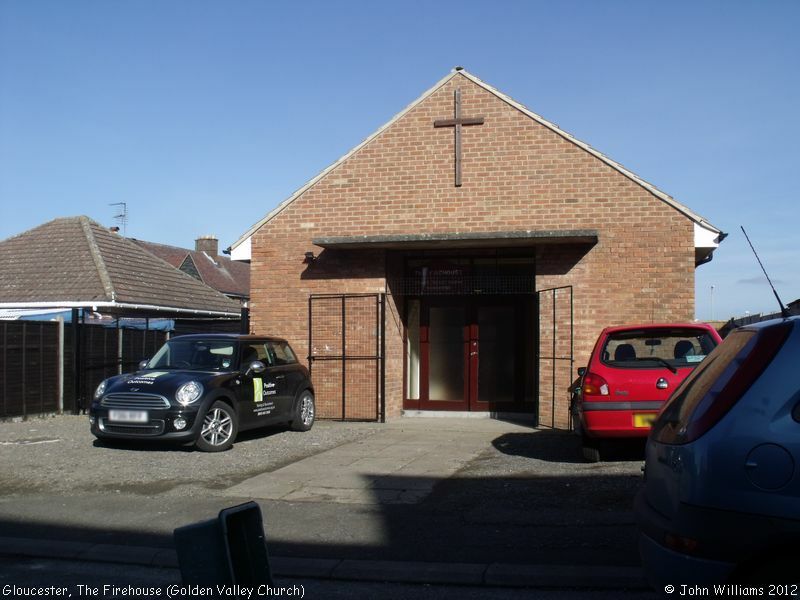 It is not known what connection, if any, there is with the Golden Valley Church in Churchdown. Now or formerly Latter-day Saints. The Firehouse (Golden Valley Church), Gloucester shown on a Google Map. Information last updated on 26 Feb 2012 at 14:04. Please also remember that whilst the above account may suggest that The Firehouse (Golden Valley Church) remains open and accessible, this may not remain so. This Report was created 2 Apr 2019 - 15:58:22 BST from information held in the Gloucestershire section of the Places of Worship Database. This was last updated on 7 Feb 2019 at 07:45.